More services, more support, more of what you need to fully restore your home or business! 24/7 Emergency Service and professional cleaning when you need it most. We clean up and restore property damage caused by storms, basement floods, appliance failures, burst pipes, sewer backups and water disasters of all kinds. When you need someone fast, call ServiceMaster Restore. Anytime, day or night, we can be there fast! Large and small fires cause devastation for your family or business. 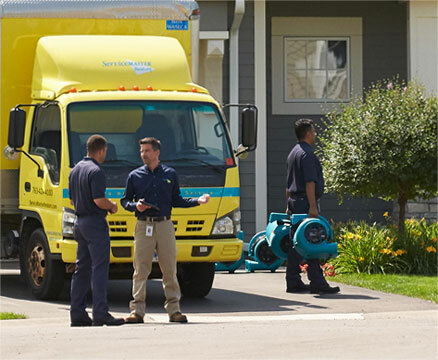 Call ServiceMaster Restore for the fastest response and restoration for smoke, soot, water and fire damage for any size fire disaster to your home or business. Our 24/7 response won’t be beaten! When you see or smell mold you need to act now! Black mold is responsible for several life-threatening health issues and requires substantial mold remediation and air purification services to remove it. Call ServiceMaster Restore to remediate the mold fast! Professional, Green Cleaning Services for the home and office. We take care of spills, spots, and regular cleaning for carpets and upholstery as well as deep cleaning grout and tile, and air ducts. If you have an eviction or hoarding situation, we can provide junk removal and cleanup for that too. ServiceMaster Restore can bring your living spaces back to life! If you have a hoarder situation and are looking for a professional, respectful company to help remove the contents and get the premises back up to code, give ServiceMaster Restore by Monroe Restoration a call. We’ll be happy to evaluate the property and provide a fair and reasonable price for hoarder clean-up and restoration. We offer the same exceptional disaster restoration services for commercial offices, warehouses, restaurants and other professional buildings that we do for our residential customers. Recommended by insurance agencies, we provide safe, 24/7 commercial disaster recovery services with little disruption to your business! Commercial and Residential Disaster Recovery for South Bend, Fort Wayne, Valparaiso and the Surrounding Areas. Disasters don’t wait for normal business hours. That’s why ServiceMaster Restore by Monroe Restoration is available 24/7. We understand the devastation fires, storms, floods, sewage, mold and vandalism bring to a family. When you call ServiceMaster Restoration we respond to your disaster calls within 2 hours or sooner. We work with homes and businesses all over Northern Indiana to clean-up fire, water and mold disasters and restore your property to pre-disaster condition or better. play_arrow Looking for a Professional Cleaning Company that uses Green Cleaning Products? With ServiceMaster Restore you not only get Northern Indiana’s top restoration company, you get a recommended green cleaning company that specializes in carpet, furniture, tile and grout, HVAC systems and duct cleaning. Whether you need a regular carpet cleaning service for your home or office, or you need emergency stain removal or emergency clean up after a flood or storm we can be there quickly with an affordable solution. ServiceMaster Restore by Monroe Restoration is part of ServiceMaster’s top team of disaster restoration professionals known as Quality Restoration Vendors. We offer insurance companies a better solution to their customers by offering a quick response and pre-authorized solutions that save time and money. We are committed to providing superior, consistent disaster mitigation services.